Alcohol Withdrawal Syndrome (AWS) refers to a spectrum of signs and symptoms that develop after a person, who has been drinking alcohol everyday, suddenly stops drinking. In these people, the central nervous system (CNS) has adjusted to the constant presence of alcohol in the body by compensating for alcohol’s depressive effects. Consequently, when alcohol levels suddenly drop, the brain remains in a hyperactive state, causing AWS. Many with AWS have multiple issues (withdrawal symptoms, polysubstance abuse, depression, and liver disease), which requires a multifaceted treatment approach, although careful evaluation and proper treatments should ensure a safe detoxification. Alcohol consumption is socially acceptable and widely used, but that doesn’t mean it’s safe. In fact, alcohol is more physically destructive when misused than nearly all other recreational drugs combined. Alcohol-related health problems are among the most significant public health issues in the United States. Participants were well fed, each consumed up to almost 30 standard drinks per day for up to 3 months. Upon abstaining from alcohol intake, these men invariably developed withdrawal symptoms. Moreover, the symptoms of alcohol withdrawal were dose dependent: The men who had consumed the largest amounts of alcohol developed the most severe manifestations of withdrawal. Heavy drinkers who suddenly decrease their alcohol consumption or abstain completely may experience alcohol withdrawal syndrome (AWS). Signs and symptoms of AWS can include, among others, mild to moderate tremors, irritability, anxiety, or agitation. The most severe manifestations of withdrawal include delirium tremens, hallucinations, and seizures. These manifestations result from alcohol-induced imbalances in the brain chemistry, which causes excessive neuronal activity when alcohol is withheld. Mild alcohol withdrawal generally consists of anxiety, irritability, difficulty sleeping, and decreased appetite. Mild alcohol withdrawal symptoms typically appear within 24-hours after discontinuation. 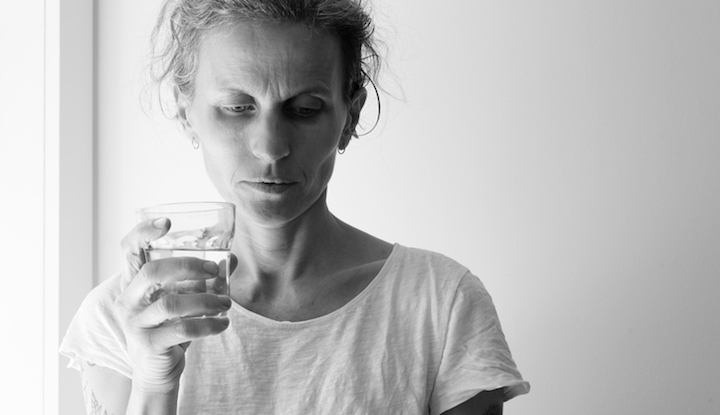 Moderate alcohol withdrawal symptoms usually occur 24-36 hours after discontinuation of alcohol consumption and include manifestations such as intense anxiety, tremors, insomnia, and excessive adrenergic symptoms. Severe alcohol withdrawal is characterized by trembling hands and arms, sweating, elevation of pulse (above 100) and blood pressure (greater than 140/90), nausea (with or without vomiting), and hypersensitivity to noises and light. Brief periods of hearing and seeing things that are not present also may occur. A fever greater than 101° F also may be seen. Seizures and true delirium tremens, represent the most extreme forms of severe alcohol withdrawal. High blood pressure, stroke, liver disease, heart disease and digestive problems. Cancer of the liver, breast, mouth, throat, esophagus and colon. Around 400 B.C. Hippocrates wrote the first clinical report on alcohol withdrawal. He wrote, that if the patient is in the prime of life and if from drinking he has trembling hands, it may well be the case that the patient is showing signs of alcohol withdrawal.